Inside Chatham Lighthouse, an active Coast Guard station. CHATHAM — A few steps from Chatham Lighthouse, on the elbow of Cape Cod, Petty Officer Third Class Sherman L. Baldwin settled into bed. Baldwin, 24, was on call that July evening in 2010 to serve as a boat crewman for the US Coast Guard Station Chatham. At 11:35 p.m., the station received an emergency call. The captain of the Bronze Monkey, a 44-foot yacht, called 911 to report an engine room fire. The station’s watch stander immediately activated the search and rescue alarm. Baldwin shot out of bed. He ran to meet three other coast guardsmen launching aboard a 27-foot boat within six minutes. Before the yacht lost power and all communication, the captain said he had five couples on board returning from a trip to Nantucket. All lifejackets and distress signaling devices were inside the cabin, which, at the moment, was containing the flames. The guardsmen opened the rescue boat’s throttle, making best speed for the last known position of the yacht — roughly 4 miles south of Chatham’s lighthouse. On scene in 15 minutes, the rescuers saw one of the stricken vessel’s passengers frantically wave a small LED flashlight to signal their location. Baldwin saw a yacht engulfed in smoke against the dark sky. “When I looked in the porthole, the curtains inside burst into flames it was so hot,” Baldwin recounted later. “The plastic doors were melting and the fiberglass started to bubble.” Baldwin and his mates rescued the passengers and raced away. Shortly after, the yacht exploded. Orange flames lit up the night. “All the passengers started crying,” said Baldwin. Boatswain’s mates Josh Perkins (left) and Sherman Baldwin in the doorway of Chatham Lighthouse. “I love it here — this is my home,” says Baldwin. The brilliant white beam of the 204-year-old Chatham Lighthouse revolves day and night across seaside shoals and beaches and down the streets of Chatham — a town celebrating its 300th anniversary this year, with the lighthouse an integral part. 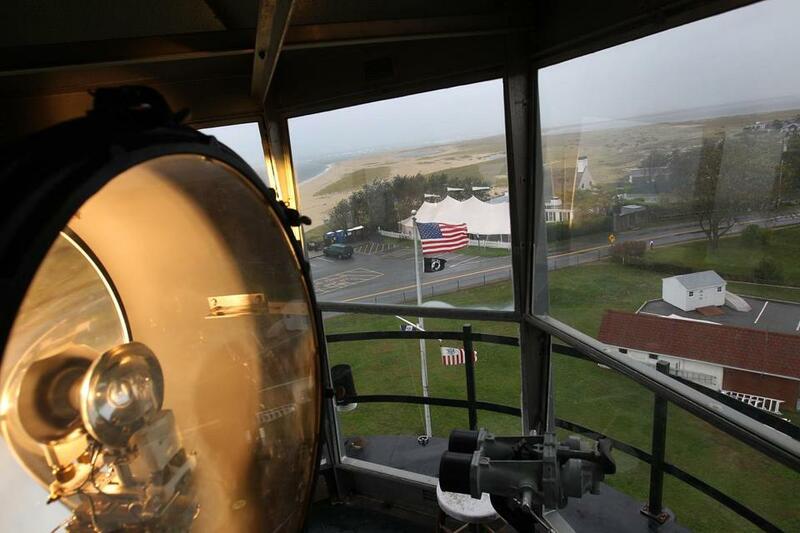 And in 2013, the beacon will be part of a different kind of spotlight, as Walt Disney Pictures is expected to move ahead with plans to make a film based on the book “The Finest Hours: The True Story of the US Coast Guard’s Most Daring Sea Rescue,” by Mike Tougias and Casey Sherman. The story tells of a 1952 nor’easter that snapped two tankers in half off Chatham’s shores. Chatham’s lighthouse was originally constructed as twin octagonal wooden towers with fixed lights 40-feet high. Decades of wind and rough weather caused the towers to deteriorate. By 1877, erosion left them in danger of toppling over the cliff. Several hundred feet inland, a unique twin light system of cast-iron towers with red brick interiors was built. By the early 20th century, with the advent of rotating lights, twin lights were no longer required. So in 1923, when the single remaining tower of the Three Sisters Light Station of Nauset, near Eastham, had deteriorated beyond repair, “one of the two towers was moved to Eastham and became part of the Three Sisters,” said Mary Ann Gray, archivist for the Chatham Historical Society. 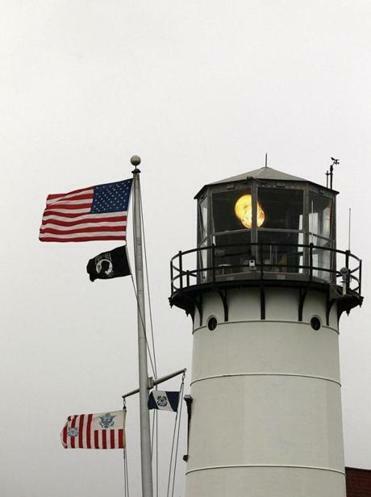 The Chatham Light’s beacon also changed. Fitted with a rotating Fresnel lens in 1857, kerosene provided the fuel for the light. In 1939, the light was electrified and by 1969 the lens and lantern room were removed, replaced by a larger, brighter lantern accommodating a rotating aero beacon. The present light, installed in 1994, displays two white lights every 16 seconds. For generations, residents have served as keepers of the light. To care for the light, 12 keepers stood the watch between 1808 and 1945. Samuel Nye, appointed by President Jefferson, was the first. Another was Angeline Nickerson, the mother of five young children. Nickerson took over as keeper after her husband died in 1848. The view can be delightful, and occasionally terrifying. In that memorable 1952 storm, 70-knot winds whipped around the lighthouse, and 60-foot seas crashed on Chatham’s shores. One of the two crippled vessels, the 503-foot SS Pendleton, was visible from the lighthouse, and three Coast Guard station crewmen and a coxswain, Boatswain’s Mate First Class Bernard Webber, launched over the perilous bar and into the storm on a 36-foot wooden motor lifeboat to attempt to save the broken tanker’s captain and crew. Baldwin and generations of coast guardsmen before him have been told the story of the heroic rescuers who rode out in near-hurricane force winds, losing the boat’s compass and much of their rescue equipment when a monstrous wave rattled their vessel, to return with 32 lives. “One person out of 33 from the stern section was lost at sea as were all eight of the men on the bow section, including the captain,” said Richard G. Ryder, a retired coxswain and the operations manager of Motor Lifeboat CG36500, which was decommissioned in 1968 and preserved as a floating museum in dedication to the memory of the Life Savers of Cape Cod. Ryder’s own family history includes his uncle’s father-in-law, George Gustavas, the last lighthouse service keeper for Chatham, starting in 1939. The four station coast guardsmen who risked their lives in the 1952 rescue were awarded the Gold Life Saving Medal. To this day, when a petty officer is promoted to chief, the new chief is ceremoniously pinned with Webber’s anchors or chief’s insignia. Townspeople are also proud of the legendary case. Residents back then rallied to help the survivors. Fishermen were on the pier when they arrived offering a helping hand. Puritan Clothing, of Chatham, outfitted the shipwrecked men. In 2010, after Baldwin and his shipmates returned with the survivors of the Bronze Monkey, the town turned out the next day. “One of the families that we rescued brought in pies from Marion’s Pie Shop. It was a very heartfelt moment,” said Baldwin. Recently, Joy Dembinski, from Arizona, stood by the chain-link fence surrounding the grounds to take photographs. “My husband has come here for 30 years to vacation,” she said. Dembinski married her husband, Lee, a widower, in 2001, and he introduced her to Chatham. “I want to have a huge blow-up of the light for my home,” she said. In March, erosion compelled the Cape Cod National Seashore to remove from North Beach, the barrier island across from the lighthouse, five beach camps, small wooden homes without power, running water, or electricity. The loss “was a downer for locals,” said Mike Davis, 24, who grew up in Chatham. For residents like Davis, another disturbing adjustment townspeople have had to face is within the sea. “We’re a fishing town and now that’s dying off,” he said. In part because of the Marine Mammal Protection Act that allowed seals to recover from near depletion, Chatham fishermen say the seals have taken big bites out of the multi-species fishing industry. “We’ve done boardings on longline fishing vessels. The fishermen say the seals take only the soft stomachs of cod, dogfish, skate, and monkfish and toss the rest to sea,” said Baldwin. Every year, on Jan. 1, several hundred residents proudly gather on the lawn before the light for a town photograph. Baldwin, promoted to second class boatswain’s mate (for mastery of seamanship) is engaged to a Cape Cod woman. He will transfer in June to a new post.